Clown Wooden Pencil is a beautifully decorated pencil with a happy clown on the top. This wooden pencil is grey. 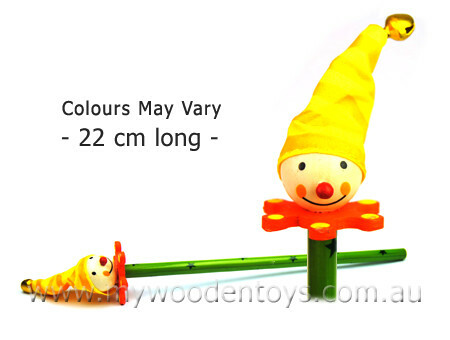 The clown has a striped cotton hat and his wooden face has a lovely red button nose. This is a sweet pencil and the clown is solidly made. Material: Wood childsafe paint, Cotton. We like this because: "Lovely stripey hat. " Hi Douglas, Thanks for the order which arrived on Wednesday! Fantastic service and love the toys.